My top nine collage showcases my art in both digital and traditional illustration and paper art. This collage also showcases my geeky side. 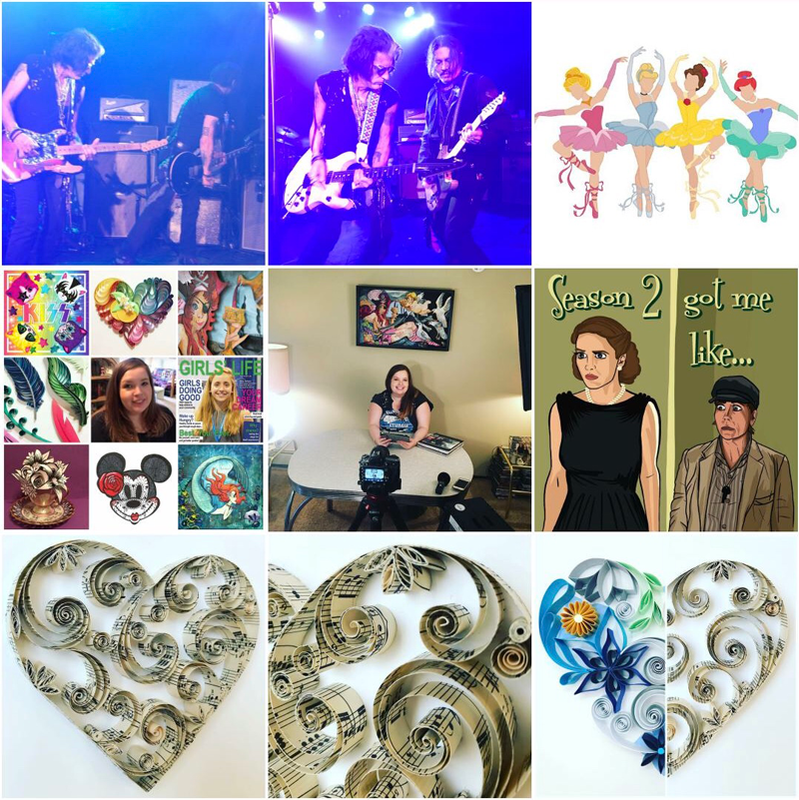 My love of fandoms is prevalent with fan art for The Marvelous Mrs. Maisel, my Ballerina Princess illustrations, and features Disney fan art including my D23 Design Challenge Pirates of the Caribbean work, and a digital illustration for KISS. And there are also two front row pics from Joe Perry’s album launch party at the Roxy in LA. This is my favorite part of my top nine photo collage. It showcases my willingness to try. I have always been a ‘tryer’ and I have always believed anything is possible. I believe in trying even if it means you might fail. The collage shows me making my audition video for Season 2 of Making It. The audition never went anywhere and I won’t be making my TV debut on season 2, but at least I tried. But I also tried to be front row at Joe Perry’s show and it happened, I entered a design contest for KISS and won, and entered the D23 Disney Design Challenge and was showcased at the 2017 D23 Expo. None of these would have happened if I hadn’t tried. My top nine Instagram posts from 2018. 2018 isn’t exactly a year to brag about for me. I felt like I was spinning my wheels yet still completely overwhelmed most of the time. The year was basically the year of failures. And not just little failures... big, life-goal-sized kind of failures. I tried to go to grad school and wasn’t able to financially make it work, I tried to resolve my debilitating migraines and still have no answers, and I tried to finish my book and that… also didn’t happen. And there are many more failures. But at least I tried. So if you feel like many things you have tried in 2018 didn’t work out, just know you are not alone. So here is to 2019, a year where we keep on trying.